This article is about the Covenant anti-air cannon nicknamed the "Mantis". For the powered exoskeleton, see HRUNTING/YGGDRASIL Mark IX Mantis. "They're setting up an AA battery. That thing'll tear the Dawn apart..."
The Type-27 Anti-Aircraft Cannon (T-27 AAC), nicknamed the "Mantis", is an automated Covenant ground-based stationary anti-aircraft emplacement. It fires powerful bolts of plasma with incredible accuracy. The plasma bolts fired by the Type-27 Anti-Aircraft Cannon are teardrop shaped, similar to normal plasma rounds, and fly in a straight trajectory. The bolts are extremely powerful, easily capable of destroying UNSC craft ranging from GA-TL1 Longswords to UNSC frigates. The weapon is incredibly accurate even at extreme ranges. A T-27 AA battery can be quickly assembled using modules transported by Phantoms. This makes them easier to deploy in the field than many other Covenant weapons platforms, including the bulkier Type-38 "Tyrant" AA cannon, and ideal for narrow gorges or dense cityscapes. AA batteries are often supplemented by multiple Anti-Air Wraiths nearby. The weapon's energy capacity is unlimited, but it must cool off and release its excess heat after every shot, exposing its weak point; the interior is vulnerable through the heat vent, which is located on the underside the cradle component. A certain amount of damage to the interior will destroy the AA battery; this makes it vulnerable to infantry and ground vehicle attacks. Troops are often stationed in the vicinity of AA guns, as well as their marksman perches, to safeguard them from ground forces. The Type-27 AA battery saw use during the Battle of Meridian, when 18 heavily guarded batteries were destroyed by the first prototype of the HRUNTING/YGGDRASIL Mark IX ADS in an action known as the "Cherbourg Run". A Type-27 AA battery saw use during the Battle of Voi on November 17th, 2552, being deployed in the town of Voi in order to keep the UNSC forces away from the Portal excavation. The UNSC planned a low-level strike, using frigates and Longswords, to attack the Prophet of Truth's Forerunner Dreadnought which was resting on the Portal, which was thought to be the Ark by the UNSC at the time. Throughout the battle, the AA battery fired continuously, and managed to destroy at least one Longsword. Marines and SPARTAN-117 eventually breached the Covenant resistance in Voi and destroyed the AA gun, allowing Lord Hood's ships to assault the Forerunner Dreadnought. 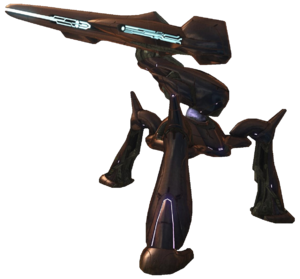 T27 "Mantis" AA guns were also used during the Battle of Installation 00, when the Covenant tried to construct them on the surface of the Ark to keep the UNSC ships above from reinforcing their troops on the ground. However, these batteries remained incomplete, as SPARTAN-117 with the assistance of several Orbital Drop Shock Troopers stopped their construction, allowing the UNSC Forward Unto Dawn to land nearby. Alternate view of the T27 "Mantis" AAC. A Type-27 Anti-Aircraft Cannon on a hill in Voi, Kenya. A rear view of a T-27 AAC, showing how the emplacement's legs adjust to terrain. The Covenant use a Phantom to construct Type-27 Anti-Aircraft Cannons. A Longsword interceptor shot down by a T-27 AAC. A Mantis AA battery firing. A plasma bolt fired by a T27 from another angle. A Mantis AA gun during the Battle of Voi.